Field sales and service reps use Mapview to visualize their data geographically and to plan the best route for their customer visits. Mapview enables you to efficiently manage your territory with easy-to-use mapping and planning tools. Improve trip planning by viewing your appointments and drop-in visits as a route, while easily visualizing other contacts along the way. Once downloaded, enjoy a free 30 day trial. Our individual use Pro Plan includes unlimited contact mapping and your choice of payment frequency: Monthly ($11.99/mo), Quarterly ($29.99/quarter), or Annually ($95.99/year). Mapview’s contact mapping software helps outside sales and service reps perfect their scheduling, route planning, and sales call process. - Easily import spreadsheets of data creating automatic groups from custom field columns. 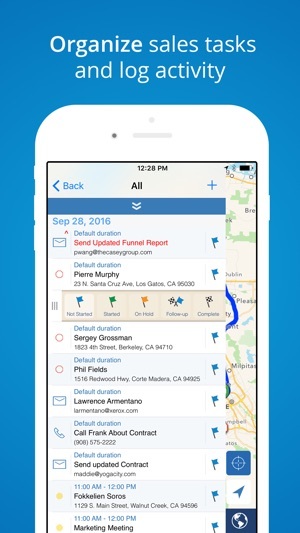 - Plan daily routes with drop-in visits and calendar appointments. Easily respond to schedule changes on the go. 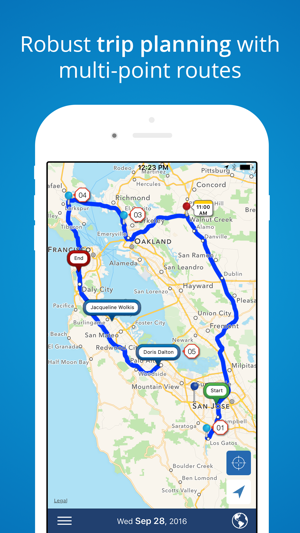 - Use route optimization to organize trips by time or distance. - Visualize your territory and travel routes to help locate opportunities along the way. - Use different pin styles to prioritize and organize accounts into groups. 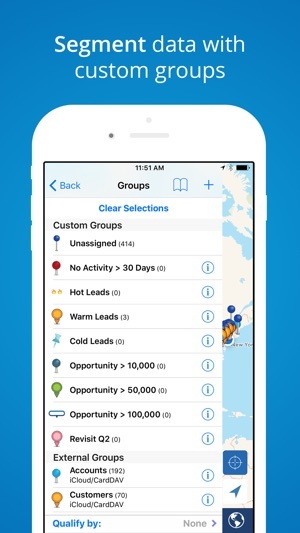 Target specific customers and prospects by filtering groups on the map. - Manage sales or service territory by sending emails, taking notes and setting up meetings in Mapview. - Log activities such as contact notes, phone calls, emails, and events - most logged automatically for you so you can spend more time selling or servicing. 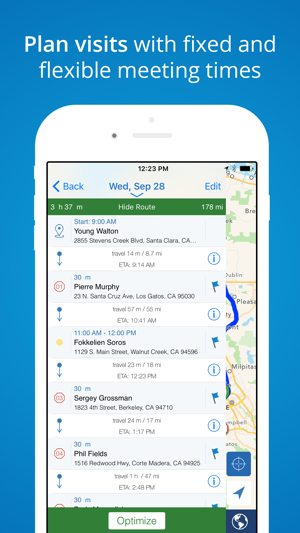 - Utilize Mapview offline by accessing saved info, routes, directions & target map area. - Individual users can export contact data, groups, and activities to a CSV file for easy reporting. 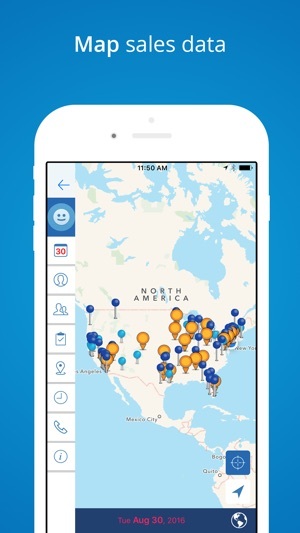 - View multiple calendars and up to 3 months of appointments at a time on the map. Manage your territory’s funnel and exceed your quota with this easy to use sales mapping and productivity tool. 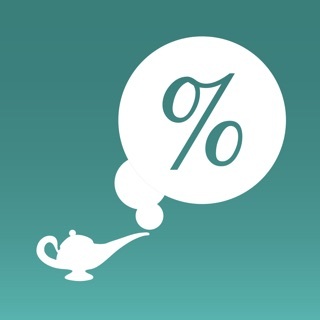 This app stands above the rest. It’s in a class all by itself. It does everything I always wished my other contact manager and mapping apps would do. I can see exactly where I am, where I’m going, where my leads & customers are AND I can even make notes about each one to help me remember later. I recently contacted the developer for help in syncing (the excessive number of custom contact filters I had created on) my iPhone with my iPad. Not only did they CALL me immediately to walk me through the process, but they also attended to me as if I were their only customer. I’ve NEVER had such a positive experience with an app developer. These guys are the real deal when it comes to a priceless app / tool and exceptional customer service. Mapview has been everything to me in my sales career. I love being able to see which of my prospects are in my area, and have navigation to each. Also, getting to log notes after each visit enabling me to pick up with the client where I left off. Any challenges I have had or assistance I have needed, their customer care group has been very quick to get in touch with me and help me out. I have an edge on my competition, and I am indebted to Mapview for that. Thank you, Mapview and the Casey Group! Cheers to many more years of changing the sales landscape. Thank you for the review! We will continue to work hard to do just that! This is such a great application for sales folks with data bases that they want to manage easily for the purpose of new prospects, existing clients and literally navigating to see them as needed. Customer Service with Kevin Casey is off the charts: He returns phone calls, walks you through the application and clearly cares about the Users and helping us navigate this application. I would highly recommend this application. Thank you for the review! We're happy to provide a quality product and service!